MENDHAM TOWNSHIP, New Jersey (WABC) -- Among the thousands of New Jersey residents affected by Thursday's severe weather was Gov. Chris Christie himself. The storms caused damage in Christie's neighborhood in Mendham Township in Morris County, and brought down trees outside the governor's home. 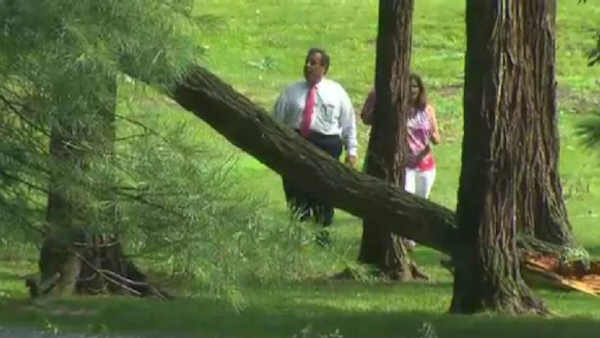 Christie and his wife Mary Pat walked outside to inspect the damage. When asked if they had power, Christie shook his head no and gave a thumbs down. There was also a fire at a vacant lot next door because the storm knocked down a power line, sparking the blaze. Christie has been among the finalists being considered by Donald Trump as his running mate on the Republican presidential ticket.